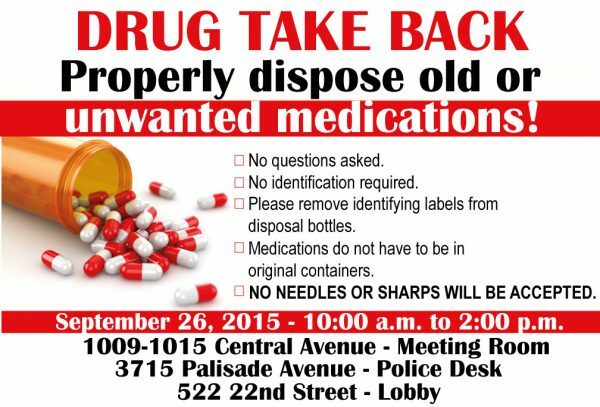 On September 26, 2015 from 10:00 a.m. to 2:00 p.m. the Union City Police Department will be hosting a “drug take back.” The purpose of the take back initiative is to give residents a safe and secure disposal site for unwanted or expired prescription medication. Make your home and your loved ones safer, properly dispose of old or unwanted medications! No questions asked, no identification required. Medications do not have to be in original containers. Please remove identifying labels from disposal bottles. NO NEEDLES OR SHARPS WILL BE ACCEPTED. September 26, 2015 from 10:00 a.m. to 2:00 p.m.